Use your keywords like a pro! Do you have your target keywords but no idea what to do with them? 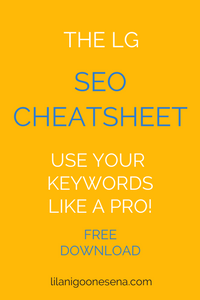 My SEO Cheatsheet tell you how to use your keywords and where to place them on your site. Pop in your deets below and let's go SEO! Thank you! My SEO Cheatsheet is winging its way to you right now.